7.45 points at 11 votes (rank 224). Experience the return of Arthur, the fearless knight, that needs to rescue the kidnapped princess "Hus" in five exciting levels full of action. 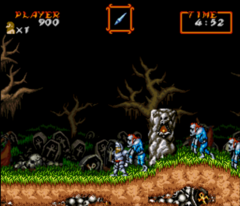 The game offers numerous extra weapons and "special" joystick controls. 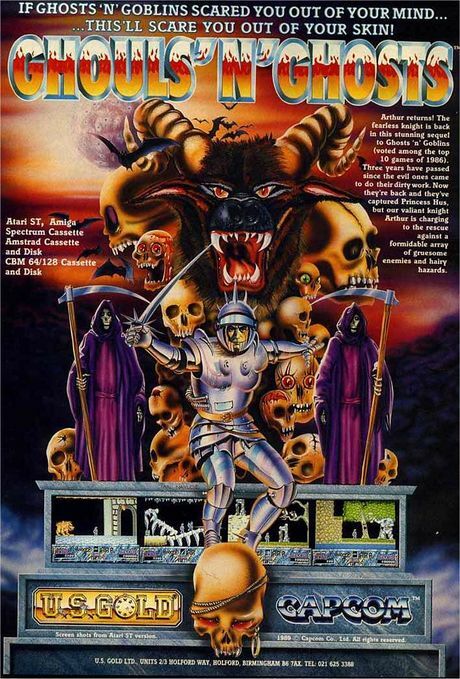 In this perspective, they rudimentarily tried to present the game Ghosts'n Goblins in pseudo 3D. During this some interesting alterations were made. 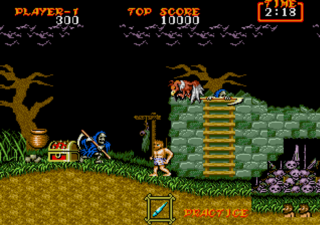 In 1988, the follower of Ghosts'n Goblins - Ghouls'n Ghosts - was released in the arcade halls with altogether seven levels. 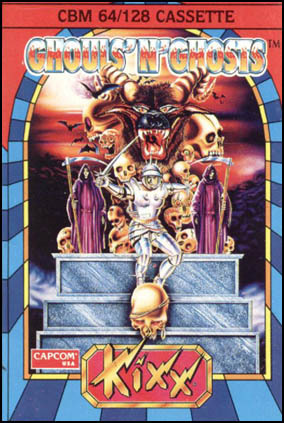 In the following year the game was converted for the C64 by the company Software Creations and published by U.S. Gold. 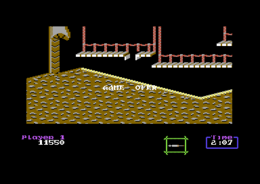 2D screen that displays a pseudo 3D underground world with fluent scrolling through the whole level. 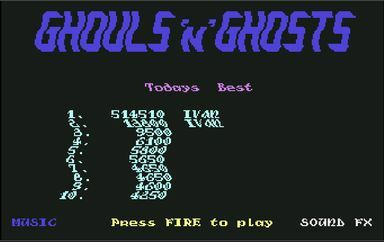 Creatures or respectively demons made of multicolour sprites appear rather comical due to their format. There are interesting animations of some demons and in the levels, as e.g. the rain. 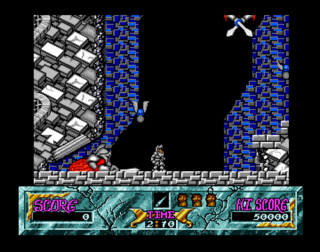 As the levels are graphically rather elaborate, every level needs to be loaded. 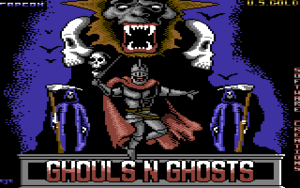 The start screen has an animated character set. In the start screen you can choose between background music and sounds FX. The background music fits the topic rather well. 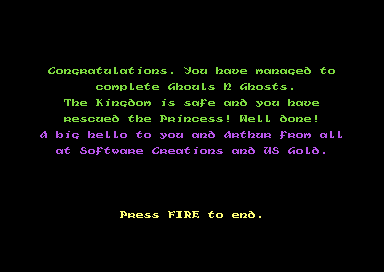 The first end boss has just reduced Arthur to his bones. If you slay a zombie with a basket on its back, you will get one of five weapons or bonus points. Magicians often hide in the treasure chests. You should eliminate them to maybe get an extra weapon. If Arthur has no armour any more, he should let himself get turned into an animal for a short time by a magician. If he gets through this phase without touching an enemy, Arthur will get back the armour. 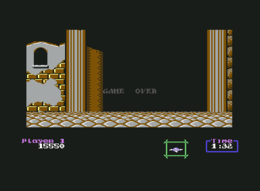 To jump over the tomb stones it is enough to do a simple diagonal jump from standing. "Continue" option: When Arthur has lost all lives, he can go on playing once from the last checkpoint starting with zero points. Furthermore, there are cracked versions with trainer menus available. TheRyk: "There's really a bunch of good ideas that could have made this sequel a real hit, e.g. 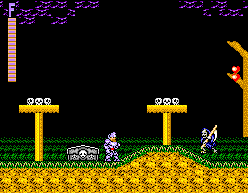 I appreciate that these grim reapers appear rather steady and do not kill you instantly as the first randomly zombies who dig themselves out of their graves in Ghosts'n'Goblins. Also the mage who casts that spell turning the player into poultry is kind of fun. But some of the predecessor's shortcomings are even more annoying here. The weapons upgrade system seems even more pointless. If you happen to catch the torch (long-burning sparkler with poor flight quality) or axe (flies like a one-way boomerang, unfortunately upwards only), you're practically done, as both are next to useless in level 1. Also some modifications are not for the better. The slopes really need a lot of practice to cope with and are not executed really thoroughly - frequently it looks like Arthur's floating. The way to the first leg in level 1 is way too long and it's really frustrating to do all that way again. However, the music fits extremely well and is somehow fascinating. All, in all, 6 points." 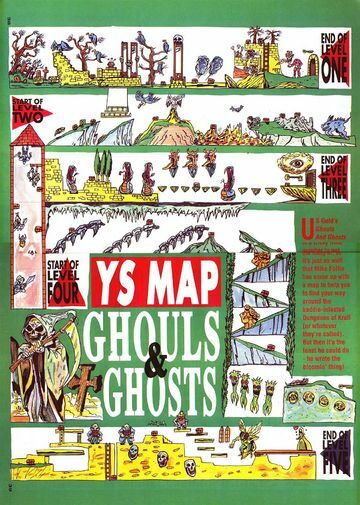 Jodigi: "Interesting sequel, which, however, caused some real problems for me, at the latest in the levitation level (level 3)..."
The game is named "Daimakaimura" (大魔界村) in the original, which approx. means "Big demon world village". The Master System version developd by Sega has a different upgrade system. Thus you can now, after finding a certain item, enter a shop and pick in return for it an upgrade for either helmet, armour or boots. Better armour endure more than one hit before they are destroyed, boots raise the speed and better helmets make new weapons and spells accessible. 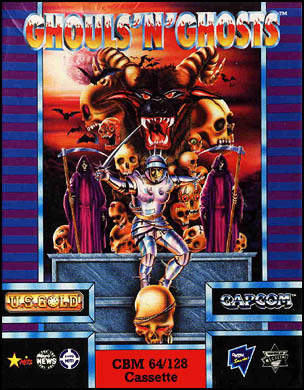 The rather similar follower of the game was released for the Super Nintendo Entertainment System and was named Super Ghouls'n Ghosts. If you slay the fire tiger in the second level sometimes you receive 500.000 bonus points and a lot of lifes. Part one of a longplay by DerSchmu. The second part can be admired here Video at YouTube . 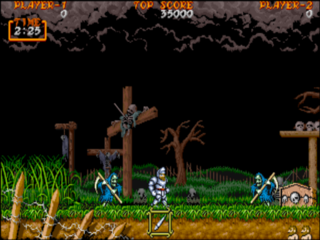 Ghouls'n Ghosts in the Killer List Of Videogames. This page was last modified on 4 March 2019, at 17:03.